Everythingneon Neon Signs feature multi-colored, hand blown neon tubing. The glass tubes are backed by a beautiful silkscreened full-color image, and the entire sign is supported by a black finished metal grid. The sign can be hung against a wall or window; they can even sit on a shelf. 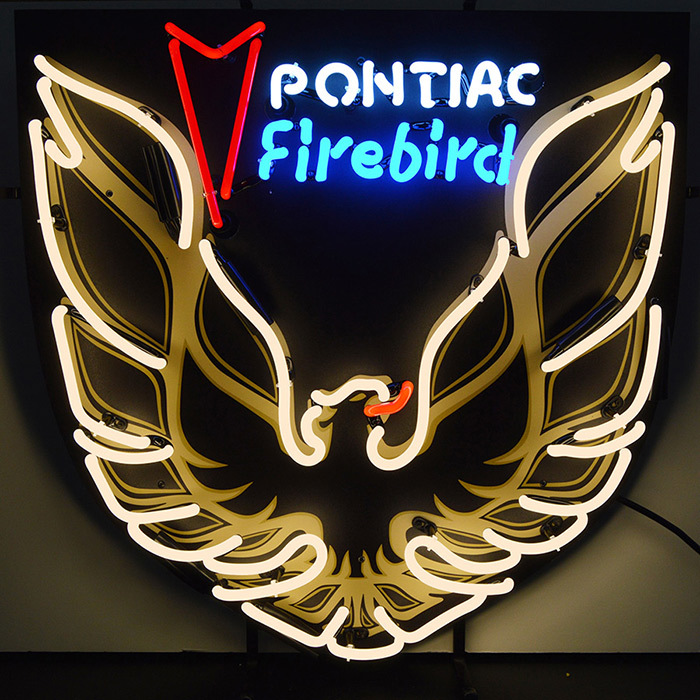 The Pontiac Firebird neon sign has bright red, white, blue and gold neon, with a full color background. All Everythingneon neon signs have a warm mesmerizing glow, and are powered by industrial strength transformers, which operate silently and more efficiently than incandescent bulbs. All you do is hang it up and plug it in - no assembly or special wiring required. For indoor use only. Pontiac Firebird Gold Neon Sign with BackingThank you for this beautiful neon sign. This symbolizes our quality food we serve to our customers. This has helped me alot to increase my sell and the fame in the town.